Dogs will step into a size that fits with the Wrap and Snap Choke Free Dog Harness in Cobalt Blue! 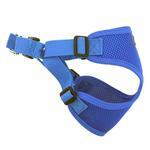 Be ready for anything with this easy-to-use Wrap and Snap Choke-Free Dog Harness in Cobalt Blue! The Wrap and Snap Harnesses by Doggie Design are easy to use, lightweight, soft and feature dynamic colors and prints. 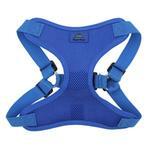 You'll love the classic look of this sporty Cobalt Blue harness. 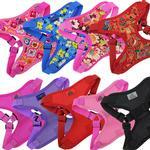 It's a ready-to-wear style that is comfortable and durable. This bright blue is perfect for patriotic events, for strolling down the boardwalk and for manning the yacht! There are double D-rings for leash attachment for added security. May we suggest one of our Barking Basics Leashes in Blue to complete your look? 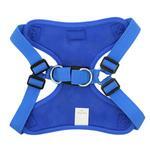 Wrap and Snap Choke Free Dog Harness by Doggie Design - Cobalt Blue Customer Photos - Send us your photo! It's always difficult to find things that fit Auggie, which is why we like the wrap and snap harness. It's adjustable, and we found the perfect fit! Posted On 11/13/17 by Roxann M from Reading, PA Yes, Roxann M recommends this product! My Chinese Crested Sookie looks adorable in this color harness!! It is cool for her on hot days!! It fits her perfectly and doesn't choke her when she pulls. She has this harness in several colors. This is a very nice harness. My corgi is pretty skittish with leashes and harnesses, and he doesnt mind this one. I do need to adjust it every time I put it on...I think it stretches out a bit when he pulls during the walk. But thats not a problem. Great price. Very easy to use, the size small fits my 8 pound Maltese perfectly. Posted On 04/11/17 by Geraldine C from Phoenix , AZ Yes, Geraldine C recommends this product! Super easy to put on dog. No choking. Love the color. Looks like it will be long lasting. Great price. Posted On 04/04/17 by Casey R from Des Allemands , LA Yes, Casey R recommends this product! Our little guy is 4 months old and almost 3lbs.. So I got him the x-small. It's a tiny bit big on him but I adjusted the straps a bit and it fits perfect! Posted On 11/26/16 by Jean from , SC Yes, Jean recommends this product! The harness was what I was looking for: soft, secure, and easy to put on. Unfortunately it was too small for my 4.5 lbs. puppy.. I've ordered the next size and am eager to get it so we can start learning to walk on the leash. We will be going to obedience school in a few days and need to be used to it. The cobalt blue looks great on a blonde Yorkie. ?? Posted On 06/24/16 by Cheryl A C from Brooklyn, NY Yes, Cheryl A C recommends this product! Great wrap around harness. So easy to put on and a well made harness. 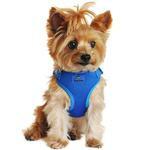 I purchased the harness in blue. My Clark (Yorkie) is quite comfortable wearing the harness and also-- looks so cute in it. Fits great, nice color, and choke free. Love there site! So many cute things for my dog and great prices and phone rep was so nice and helpful.